The teaser ends with the star swirling his sunglasses in a circular motion before wearing it in his inimitable style. He may have skipped his date with his fans on his birthday, but his followers across the State and elsewhere too were excited as ever in celebrating Rajinikanth's birthday, which also coincided with the release of teaser for the Superstar's film Petta on Wednesday. “Happy birthday superstar, Rajinikanth. Here is the Petta birthday ‘treatser’,” read the caption of the video, which hit the Internet on Wednesday morning. 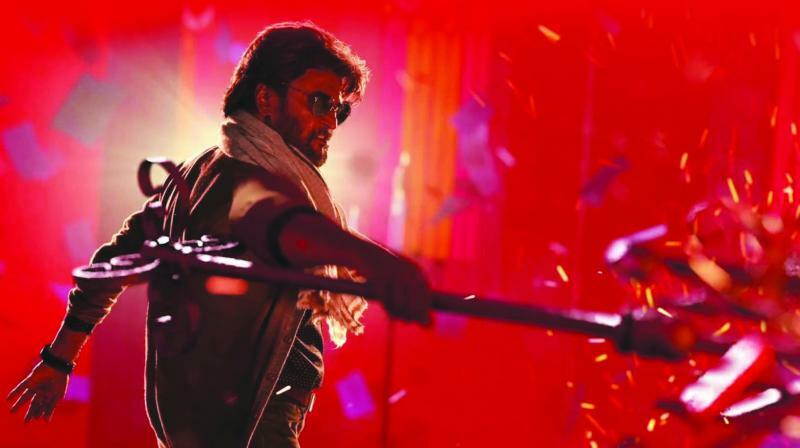 The Petta teaser, released by Sun Pictures, is a birthday tribute to Rajini, providing a glimpse of the Superstar's roles. The teaser ends with the star swirling his sunglasses in a circular motion before wearing it in his inimitable style. ‘Petta Teaser’ and ‘Happy Birthday Thalaiva’ were some of the hashtags trending on Rajinikanth’s 69th birthday. Directed by Karthik Subbaraj, Petta also stars Simran, Trisha Krishnan, Vijay Sethupathi and Nawazuddin Siddiqui. It marks the first collaboration of Rajinikanth and Karthik Subbaraj. The dialogue-free teaser is filled with montages of the actor after he is first seen walking down a cobbled street. His honorific, Superstar, is spelt out in electric-blue lights. The 80-second video ends with a bonus for the actor's fans: his characteristic ringing laughter. This is Rajinikanth’s 165th feature film. Not much has been revealed about the film’s plot though Subbaraj has promised that it would be a light-hearted action-thriller, unlike the superstar’s recent politically charged films. Meanwhile, Rajini's film 2.0 Hindi version has grossed over `164 crore. The lavishly funded (said to cost `570 crore in the making), 2.0’s global box-office taking so far is in excess of `620 crore. To his fans, Rajini is not just a film hero but an inspiration and a revereda god. And it goes without saying that his film launch is always a celebration time. And as the actor-turned-politician turned 69, his followers flooded the social media platforms including Twitter, Facebook and Instagram with their wishes. They kept the temples, dargahs and churches pulsating too, by offering prayers. Rajini who will be signing off 2018 in style by starring with Akshay Kumar as Pakshirajan, in 2.0, had a humble beginning in Apoorva Raagangal that featured Kamal Haasan in the lead role. The newcomer Shivaji Rao Gaekward, better known by his screen name of Rajinikanth, got noticed by filmmakers and he shot to fame. Initially, he played the role of a 'villain,' and a vengeful character.